The Romantic Road is world renowned as a beautiful touring route. From historic Würzburg to the cradle of the Alps in Füssen, you encounter both stunning countryside and countless medieval towns. Bookending the journey are two highlights – the UNESCO listed Wurzburg Residence, and an icon of Germany Schloss Neuschwanstein. En-route you’ll visit Rothenburg ob der Tauber, the most complete medieval town centre in Germany. I awoke early at my hotel in Rothenburg. I was buzzing to get going and could feel the dappled sunlight peeking through the curtains. It was going to be another baking hot day under clear blue skies. I was also hungry. 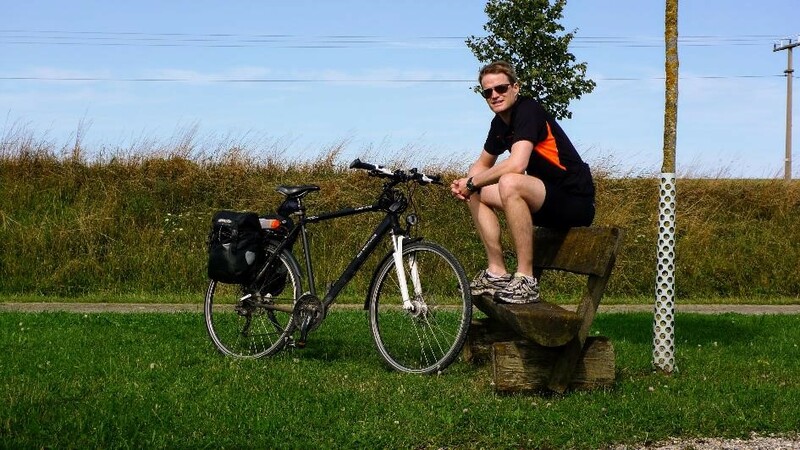 This is one of the benefits for pedalling for about eight hours a day – you can eat a lot and not worry about the waistline. I had a good German breakfast of muesli and yoghurt, then a couple of rolls with salami and cheese. There was an awful lot more to see in Rothenburg, and I felt bad leaving in such a hurry. But I knew I’d be back before long and it was time to press on. The route took me first along a cycle path neighbouring a busy road, and then a long downhill stretch as we headed back down into the Taubertal. By a school there was a pathway leading through a hedge and away from the road. Once the other side of the hedge, I found the peace and tranquility of the Romantic Road waiting for me once again. 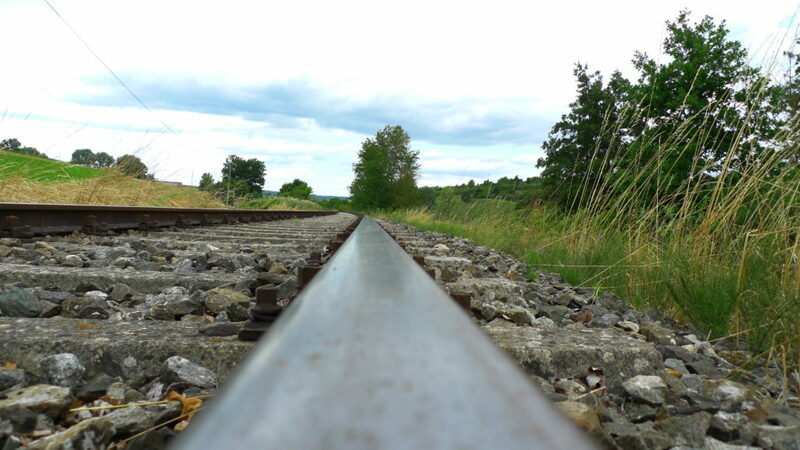 The next hour passed by in a blur of long swooping sections of track cutting through fields of green crops. I made good time on these fast and flat sections, the wind absent under a perfect blue dome. I had this track to myself, being disturbed only by the buzzing of insects and birds circling lazily above me. 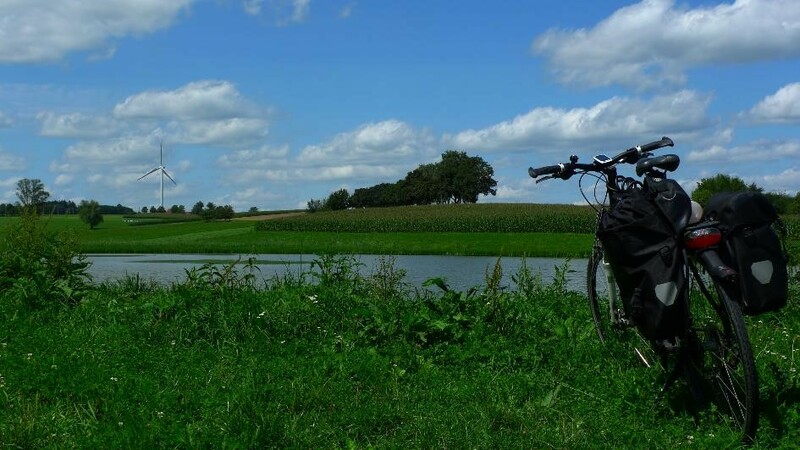 This was perfect cycling weather, and a perfect cycling landscape. Somewhere on the outskirts of Diebach after about 15km I stopped to take a drink and check the map. It was a good time to stop. Not far beyond was the first major hill of the day – up to Schillingsfurst and past a large castle. Just before this, the route passed under a viaduct carrying the A7 Autobahn. It always seems strange on a long bike journey to come into contact with so many rushing vehicles and noise – it feels like a different world. Dinkelsbühl makes quite an impression for the first time visitor. 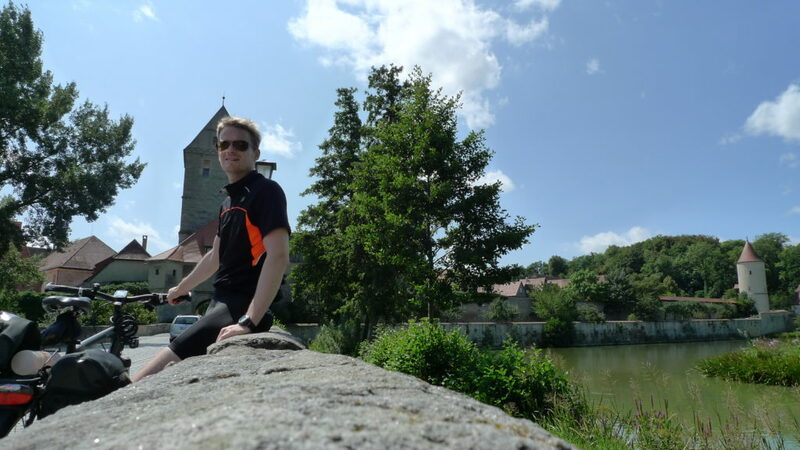 Approaching the Rothenburger Gate, you are met with a perfect view of the ancient walls behind a large carp pond. 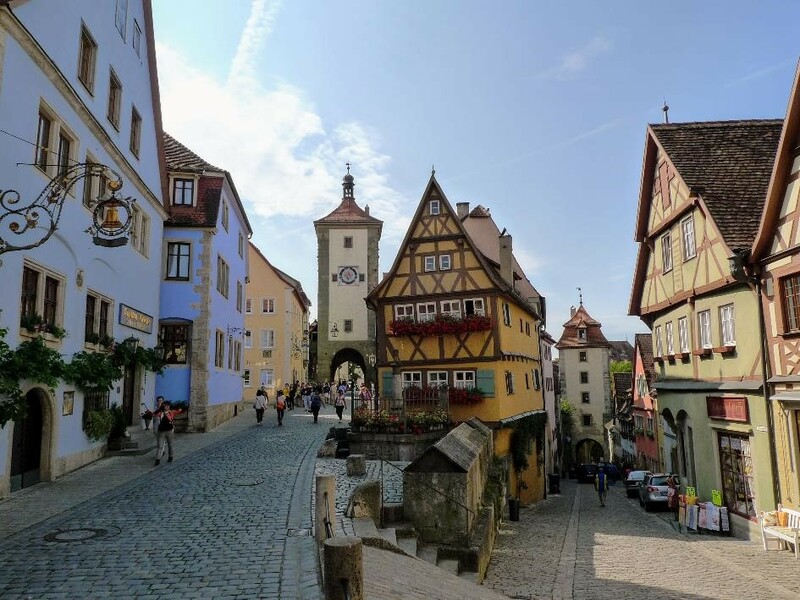 It looked like a slightly smaller version of Rothenburg – perhaps all the more picturesque for the relative lack of tourists compared to the better known brother. Dinkelsbühl centreLeaving Dinkelsbühl, I carried on following the river valley for some kilometres along quiet by-roads and wooded tracks. After around an hour, I came to a ridge-line and was met by an expansive view across famland as far as the eye could see. In the far distance was a large church tower that according to my map was probably Nördlingen, still some 15km distant. This was the “Nördlinger Ries” – a large depression in the land probably formed by a meterorite impact 14 million years ago. 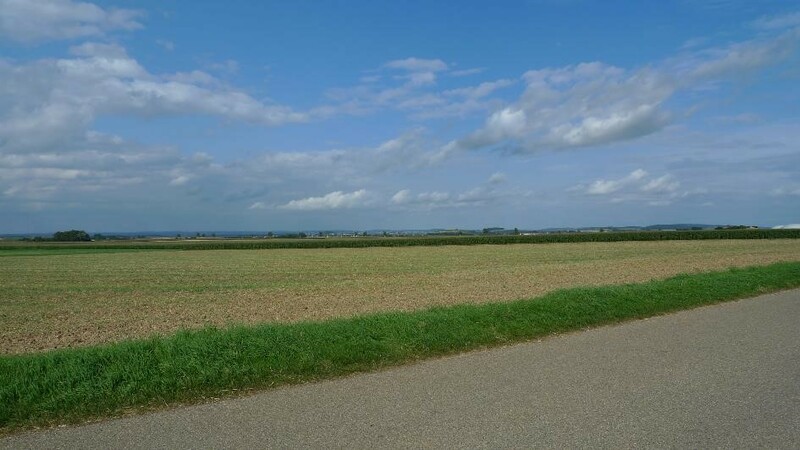 Although it was flat and I could see where I was aiming in Nördlingen, the going was a little frustrating. This was farmland and so the pathways zigzagged somewhat adding to the distance I needed to travel. 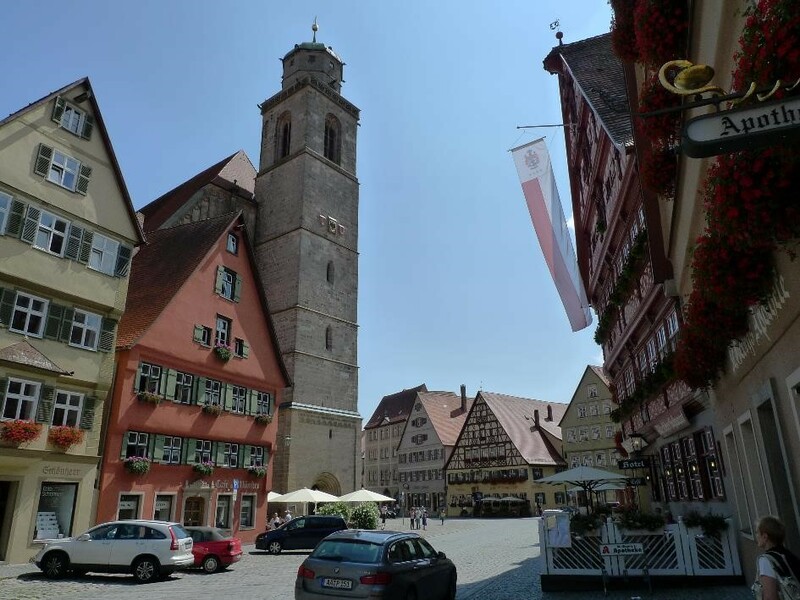 I eventually reached the outskirts of Nördlingen, which seemed to be not just a relatively large town but also an important transport intersection. I weaved my way across railway lines and several busy roads before reacing the walls of the old town. This was again a beautifully preserved town encircled by walls, with at its heart the enormous church tower known as the “Daniel”. A later check online showed me how beautifully symmetrical the heart of the old-town is from above. Time was now getting on as it was mid-afternoon and I had been on the road for some six hours. My attention was slowly turning to train times, as I didn’t want to end up sitting on a platform for hours that evening. I made a quick stop in Nördlingen for an ice-cream, and then pressed on. 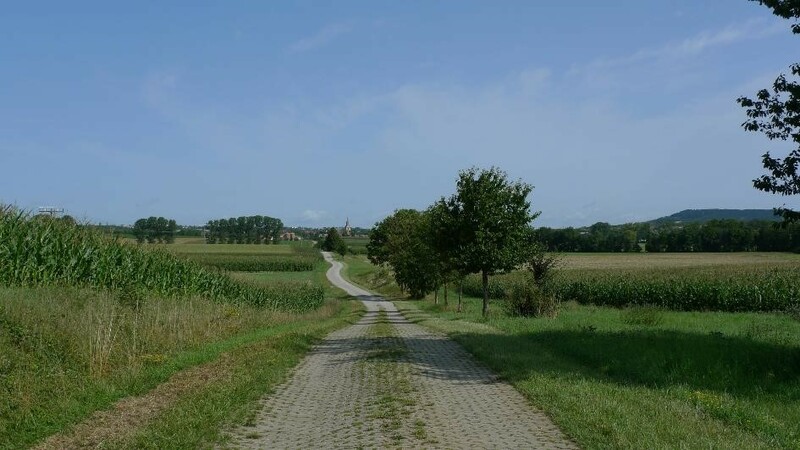 I headed due south away from Nördlingen, and after a few kilometres the land started to rise and the route took me East. This was the crater rim, and rather than having to climb it, we were heading back toward the Wörnitz River and a gap in the ridge. Passing through several small villages in the flat landscape, I was amazed at the number of apple trees I saw. 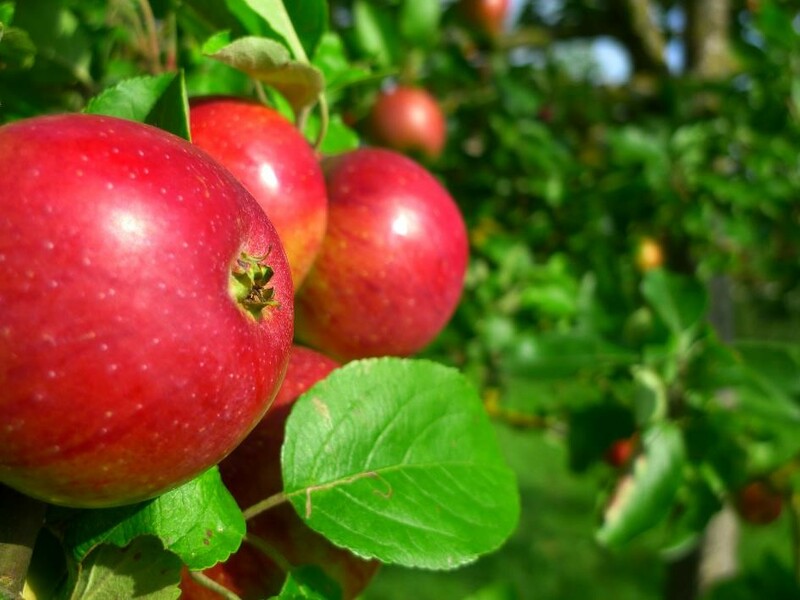 Many were already stooping under the weight of hundreds of shiny red apples that looked good enough to eat. I grabbed one, but sadly after only one bite I realised they had another few weeks to go….it was still far too sharp to eat. Shortly after re-encountering the river, I found myself in Harburg. This village clings on one side of the river to a steep cliff, and on the other side spreads across river meadows. All of this is glowered down upon by Burg Harburg, perched high above the river on the Romantic Road. I rode across the river on the ancient Steinerne Brücke, massively built to withstand the floods which clearly dug this river valley so wide. Making a turn south and following the river, I was now on the home straight with only about 10km to go until Donauwörth. 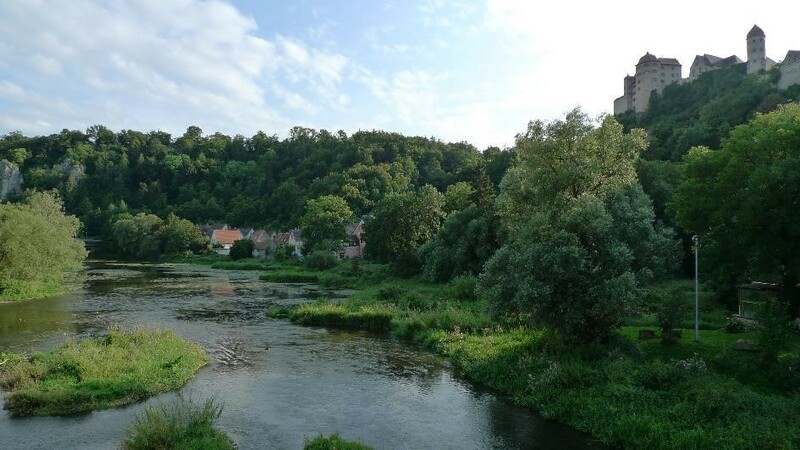 The final segment of the Romantic Road cycle route followed the meandering river valley until Donauwörth came into view. The town was visible from some way off, perched on a small hill in a curve of the river. Donauwörth is a town of huge strategic importance, since it lies at the meeting point of the Dörnitz and Donau (Danube) rivers. This was as a result the crossing point for many armies in centuries past. It didn’t have the medieval core like Rothenburg or Dinkelsbühl, but the main street (Reichsstrasse) was pleasant albeit quiet on this late Monday afternoon. I’d now reached the end point of my trip on the Romantic Road, and was glad to find the Gaststätte Goldener Hirsch. 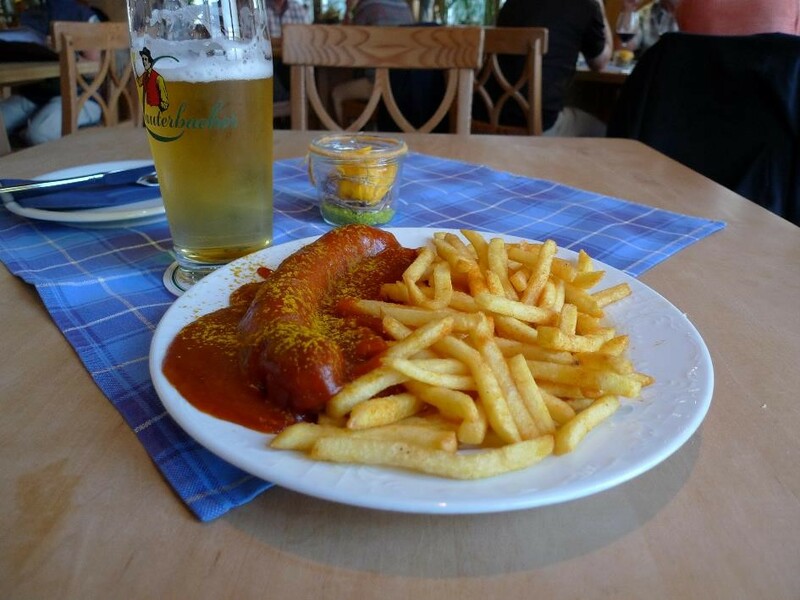 The service was lightning fast, and I could have kissed the waitress when she bought me my Currywurst within about 5 minutes. I ate and drank quickly, since I had only about 40 minutes before my train left. The sausage was good, and the beer was fantastic. I left refreshed, and peddaled quickly to the station to catch my train. I found the station back down in the valley and across the river. It was dead quiet at about 8PM on a Monday evening, and having purchased my ticket I settled in on the train which was already waiting at the platform. I was happy to be heading home to put my feet up, but sad to be leaving the open road behind me. It’d been two days of perfect cycling along the wonderful Romantic Road. If anything I’d done it too fast. The towns and villages I’d seen deserved more than a pass-through on a bike, and I vowed to return once more and really take my time. 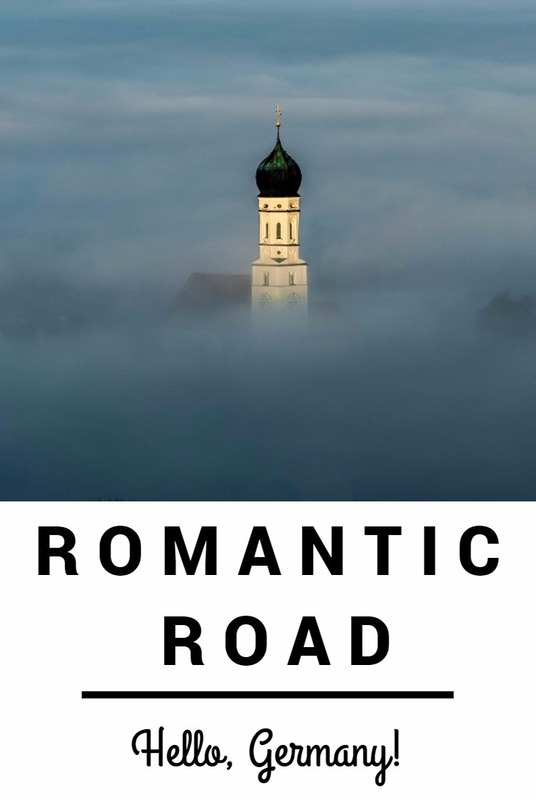 The Romantic Road delivers not just romance, it delivers a beauty and history second to none. Do it.